A collection of Victorian costumes and clothing for men - men's vests, hats, shoes, suits - everything to dress Victorian, Steampunk, American Civil War, Dickens & Sherlock Holmes. 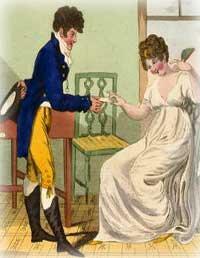 Period clothing is featured from the years of Pride & Prejudice to the Victorian era to the 1920s. Read about top hats and the proper attire for the Victorian gentleman. Steampunk enthusiast? Steampunk clothing, at heart, is Victorian. Steam punk clothing has a distinct Victorian look and feel with the addition of creative embellishments reminiscent of the extraordinary inventions of the Victorian era. Become inspired with period frock coats, sports clothing & gentlemen’s accessories. When dressing for steampunk or Sherlock Holmes activities, remember that the extended wardrobe of the well-to-do Victorian gentleman included numerous garments and costumes designed for specific leisure and formal activities. Gentleman followed the rules and protocols for proper dressing. Victorian mens clothing that was both appropriate and simple - could never offend, nor render its wearer conspicuous. The proper Victorian gentleman was not seen outdoors without a hat, usually the straw boater. The top hat was required for formal day and evening wear, but by the 1870s, a gentleman could choose from a variety of styles of headgear for informal wear. For a walk in the damp London fog, Victorian clothing for men would include a stylish overcoat. 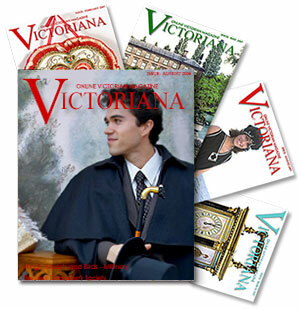 To know how to dress Victorian you will find suits, shirts, hats, socks, underwear and more. The proper Victorian gentleman was not seen outdoors without the correct style hat. The top hat was required for formal day and evening wear, but by the 1870s, a gentleman could choose from a variety of Victorian hat styles for informal wear. Leisure Victorian clothing for men in 1867 included an extended wardrobe of garments and costumes designed for specific leisure activities. 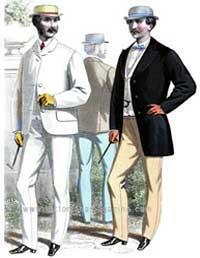 Here you will find Victorian mens clothing for bicycles, tourists, shooting, yachting and more. Or you can learn How to Dress Victorian - 1880s style with suits, shirts, hats, socks, underwear and more. For fashions in the early 1900s, dressing the Edwardian man included clothing for leisure sports, such as horseback riding, golf, tennis, and yachting. These activites were popular with the upper class during the Edwardian era. Featured are color lithographs of Edwardian garments suitable for horseback riding, tennis, and yachting. The wearing of a top hat began by making a statement, not merely being worn as part of a costume. Gentlemen were simply saying they were important and classy. How to dress Victorian ... according to “The Gentlemen's Book of Etiquette,” the first rule of guidance for Victorian clothing for men is, "Let the dress suit the occasion." 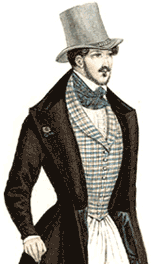 For a walk in the damp London fog, Victorian clothing for men would include a stylish overcoat. In the late 1890s, Victorian men were able to purchase their fall and winter coats from department store mail-order catalogues. The straw boater was the rage in the late 19th and early 20th centuries for Victorian men. Men of all classes appreciated the light, cool, comfortable qualities of the straw hat. Showcased is a selection of Victorian period clothing for men in the 1870s. Featured are morning promenade suits, morning lounging apparel, a visiting costume, and attire for evening dress. 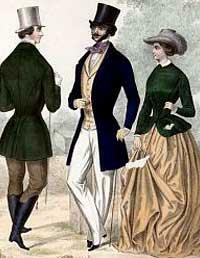 The Victorian gentleman followed the rules and protocols for proper dressing. Victorian mens clothing that was both appropriate and simple could never offend, nor render its wearer conspicuous. For those who think reenacting and living history events are just tea-sipping poetry reading events … watch this video! An elaborate fancy dress party for the rich and famous with fabulous fancy dress costumes was given in New York. Victorian clothing for men in the 1860s feature billiard and smoking jackets, serviceable dressing gowns are made of dark gray woolen serge, buttoned and laced shoes are more fashionable than boots for street wear, scarf rings of coral, watch-chains. As the 1860s marched on, the war took its toll not only in lives lost but on fashion, supplies, and every aspect of life. Pictures of civil war period clothing. A smoking cap or lounging cap was popular as informal Victorian mens wear from the late 1840s through the 1880s. Pattern to make a man's Civil War era shirt. The pattern given is the size for a shirt for an ordinary sized man. Of course, it must be altered according to the size wanted, increasing or decreasing in regular proportion. During the mid-19th century, gentlemen’s waistcoats had a tendency to feature luxurious fabrics such as silk brocade or velvet, and at times even decorated with colorful silk embroidery. Make an authentic Victorian smoking cap with directions and pattern from a Victorian magazine. A marvelous fashion documentary reveals what it took to be stylish throughout 200 years of British history as it explores men, women, and children’s costume from 1720 to 1957. A fascinating look at the details of luxurious textiles, exacting tailoring techniques, and lush trimmings. Side-by-side displays of men’s and women’s outfits from the 1700s through the 1900s. Explores the relationship between active sportswear and fashion from the mid-19th century through the present. A look at the costume design for the film The Conspirator highlighting the process of researching, designing, and producing accurate costumes for the 1860s. These Edwardian era men’s shoes were never worn and are like new! Looking good 200 years ago. discover the appropriate styles for early 19th century morning attire, walking costumes, and evening fashions. Colorful 19th century prints showing the latest styles of men's clothing from the 1830s. Discover the style of men's clothing during the early Victorian era. A fun video montage of your favorite men from period dramas and films such as Sense & Sensibility, Wives & Daughters, Pride & Prejudice, and Persuasion. Attending a Flapper party or want to plan a Boardwalk Empire bash? 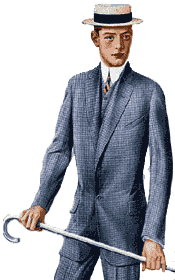 Provided is a 1920s dress chart advising the debonair gentleman on how to dress for a variety of social situations. As variety of fancy dress costume is desirable to party-goers it has become customary to hire ready-made fancy dress costumes from a costumer. Auction catalog with descriptions of royal Victorian clothing. A reprint of a 1937 auction catalog of clothing worn by British Royalty in the 19th and early 20th centuries. A late Victorian man's hat. Victorian Wedding, the proper attire for the Victorian bride groom. Men's clothing accessories from 1920. See wedding photographs of early 20th century brides and grooms from the Library of Congress. Preservation of fragile vintage textiles can carry a hefty price tag for museums. Because of that, some museums have made the tough decision to discontinue presenting their textile collections. What happens to these pieces? Victorian online resource about the life of the Victorian gentleman; his clothes, his manners, his amusements and politics. A young married woman, wishing to entertain some of her husband's friends hit upon the idea of a high tea. The custom of "visiting cards" for the gentleman. A collection of sterling silver pieces including Tobacciana, antique cigar cutters and vintage cigarette cases. What does a gentleman wear and bring to a Victorian wedding... a Victorian etiquette book tells what is required of the ideal wedding guest. The Unsuitable Suitor of 1879- A Victorian "Brush-Off"
The rules and suggestions for courtship and romance occupy most of the space in Victorian etiquette and letter writing books... there is generally one curt letter of refusal to a marriage proposal. Advice to the Victorian husband- "You give your wife a certain sum of money … I really cannot see the necessity of obliging her to account to you for the exact manner in which she has laid it out. " Suggestions for a Christmas gift for the Victorian gentleman. Recreate a Victorian gift for a re-enactor.